What is a Cabin Air Filter and why should I replace it? Motor oil breaks down over time. When it breaks down, it loses its effectiveness and can no longer properly protect your engine.In addition to lubricating an engine’s moving parts, motor oil is designed to carry combustion by-products away from the pistons and cylinders. It is designed to deal with the small amounts of water that form as the engine heats and cools, and to collect the dirt and dust that enter the engine through the air-intake system. It also handles acids that are formed by the reaction between water and other contaminants. Sometimes there are even fuel leaks (fuel dilution) or coolant leaks that get into the oil system. 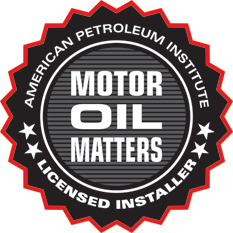 As a car is driven, the level of contamination in the motor oil constantly increases. The oil filter removes particles as the oil passes through the filter, but over time an oil’s additives are used up and the oil itself can start to degrade (oxidize or thicken). At that point, the oil can no longer do its job and must be changed. The rate at which contamination and additive depletion occurs depends on many variables. One of these is driving conditions, which vary greatly and have a direct effect on the useful life of the oil. Other factors include the precision of ignition, fuel injection or carburetion adjustments, air cleaner service and the general mechanical condition of the engine. What’s good for the environment is good for your wallet as well. leads to excessive fuel consumption. fuel consumption. Be sure to check your tires regularly. Ensure your car is properly and regularly maintained. Poor engine lubrication, wheel alignment and poorly adjuste brakes can increase fuel consumption. How Often Should my Air Filter be Replaced? month or two in a rural setting where the vehicle is driven frequently on gravel roads. Changing it annually or every 15,000 miles for preventative maintenance may be a good recommendation for the city driver, but not its country cousin. where it creates a significant restriction to airflow. But when exactly that point is reached is subject to opinion. deteriorate and get progressively worse until the dirty filter is replaced. A cabin filter, often called a dust or pollen filter, is a filter that effectively traps pollutants such as mold spores, pollen, dust, bacteria ,exhaust fumes and diesel soot before they reach the interior of your vehicle. By trapping these pollutants before they enter the vehicle it keeps the interior of your vehicle cleaner and reduces the amount of contaminants entering your lungs. Your cabin filter also needs to be replaced on a regular basis to keep your vehicle’s heating and air cooling system operating at its peak condition, much like the a household air-conditioning system. Although vehicle recommendations vary and much depends on the driving conditions, cabin filters should be replaced every 15K to 20K miles or at least once a year.